I know what you’re thinking: It’s a trick. Those can’t taste like donut holes. You’re thinking that what we’re calling No-Bake Cinnamon Sugar Donut Holes are nothing more than energy balls with a fanciful, misleading name. Nice try, Beachbody. Wrong! These little treats really do taste like donut holes. A dozen eager taste-testers at Beachbody headquarters agreed, and raved that these are surprisingly close to the real thing. Now you’re thinking: How’d they do it? Lots of testing – and sampling – to get the right cakey texture and spiced donut flavor (sometimes our jobs are really hard). We blended Vanilla Shakeology with almonds, coconut, dates, honey, and spices to get a flavor and texture that is authentically donut. The mixture is a bit crumbly after a trip through the food processor, but when it’s squeezed into shape, it holds together nicely. 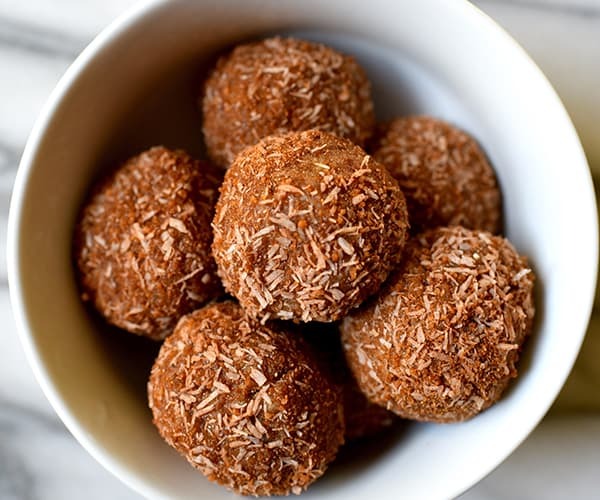 Once it was formed into balls, we rolled our No-Bake Cinnamon Sugar Donut Holes in a mixture of cinnamon, sugar, and coconut for the finishing touch. They’re not too sweet and have just the right amount of spice. Why do you need to soak the almonds? Almond skins have a bitter element, and almonds by themselves make the donut holes too dry. Soaking the almonds in a bowl of water in the refrigerator overnight loosens the skins, and plumps up the nuts to add moisture to this recipe. In the morning, you can easily pinch the almonds out of their skins. Even though these little delights are a wholesome alternative to actual fried and sugar-coated donut holes, they are still a treat with a fair amount of sugar and calories. That means: Don’t eat them all at once! If you want to reduce the sugar, you can swap one tablespoon of honey for almond butter or unsweetened applesauce. • If you don’t have time to soak almonds overnight, you can cover them in water and microwave them for 1 minute. Cool before using. These healthy cinnamon sugar donut holes are healthier than regular donut holes, but they're still super tasty! Soak almonds in water overnight to remove skins; drain. Set aside. Place 1½ tsp. 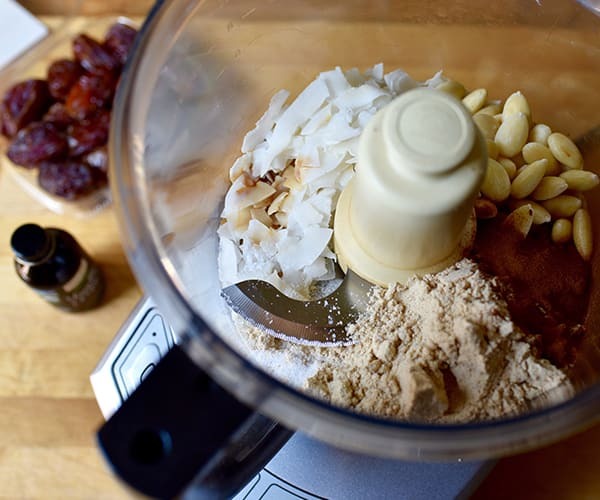 coconut, cinnamon, nutmeg, and sugar in food processor; process for 20 seconds. Set aside. Place remaining ½ cup coconut in food processor; process for 1 minute to release oils. Add almonds, Shakeology, extract, and salt; pulse until well blended. Add dates; process until well blended. Add honey; process until well blended. Roll into fourteen balls, about 1-inch in diameter each. Roll balls in cinnamon mixture.